Some of you might recognize the name Monster Miata. These were actually a thing back in the day, with full-on conversion kits for Ford’s old pushrod 5.0-liter V8 readily available. GM LS-swap kits followed, but the end-result was still the same: a tiny two-seater Mazda MX-5 Miata with a big thumping V8 up front. This one – a beautiful black 1992 model – isn’t quite the same as others, however. For starters, you can buy this one ready-to-go in the vicinity of Asheville, North Carolina. If you do, be prepared to have a nest egg for tire replacement because this isn’t a typical V8-swapped Miata. Underneath the comically tall cowl hood is a Ford Cleveland V8 that used to have a displacement of 5.8 liters (351 cubic inches). This one has a stroker kit, which in simple terms means the travel (stroke) for the pistons in the cylinders is increased, thus creating more room for air and fuel to go boom. 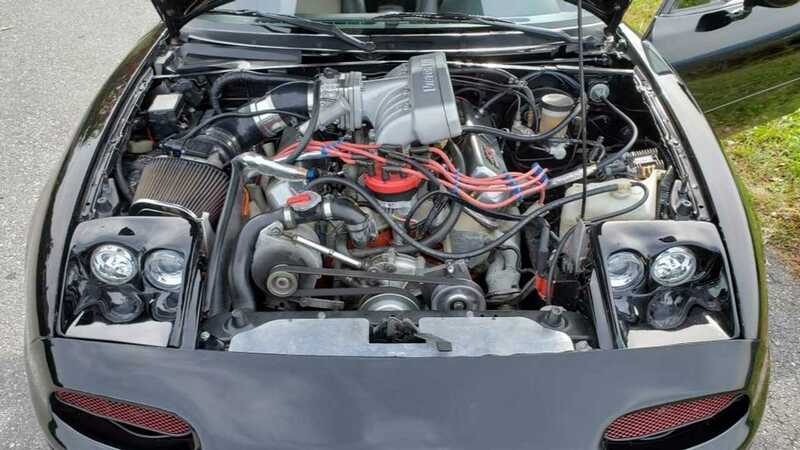 The engine in this Miata now displaces 6.7 liters (408 cubic inches), and though we aren’t told how much horsepower the mill generates, it’s enough to send this Miata through the quarter-mile in the low 11-second range. For comparison, that’s dead even with a new Dodge Challenger SRT Hellcat so yeah, this is a seriously quick Miata. It’s more than just a big engine, too. The Craigslist ad mentions a laundry list of upgrades, not the least of which are a fuel cell, electrically controlled exhaust dumps for free-breathing power, and a modified solid rear axle from a Ford Mustang to handle drag strip launches. We suppose you could take this Mazda out for some canyon carving, but we suspect it’s more at home on straight roads now. The seller is asking $20,000, which is certainly well above what you’d pay for a normal Miata from the early 1990s. Of course, this is about as far from normal as you can get, aside from going full country with a lift kit and massive off-road tires. Considering the work and parts invested, it would be hard to build an identical car for the same price, and with this one listed as running perfectly, it’s ready to melt tires right now. Hey Santa, is it too late to make a quick stop in North Carolina? We promise we’ll be good.